Chris Dean's Syd Lawrence Orchestra - You'd all heard of Syd Lawrence and his Orchestra... well since his retirement in 1996 the guys have been directed by Chris Dean and has over 1200 classic Big Band titles including Glenn Miller's 'Moonlight Serenade' and 'In The Mood', Tommy Dorsey's 'I'm Getting Sentimental Over You' and a whole lot more! 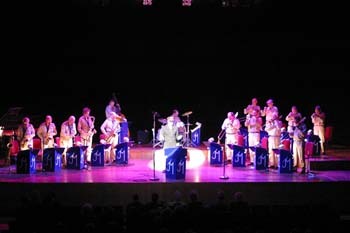 John Miller and his Orchestra - formerly the Herb Miller Orchestra - is the only Big Band performing the music of Glenn Miller with direct family links to the great man himself... John Miller is the nephew of Glenn Miller. Capturing the glorious memories through his Uncle's music, your audience will be enthralled by what they hear, taken back in time by the costumes of the era... a truly remarkable experience!